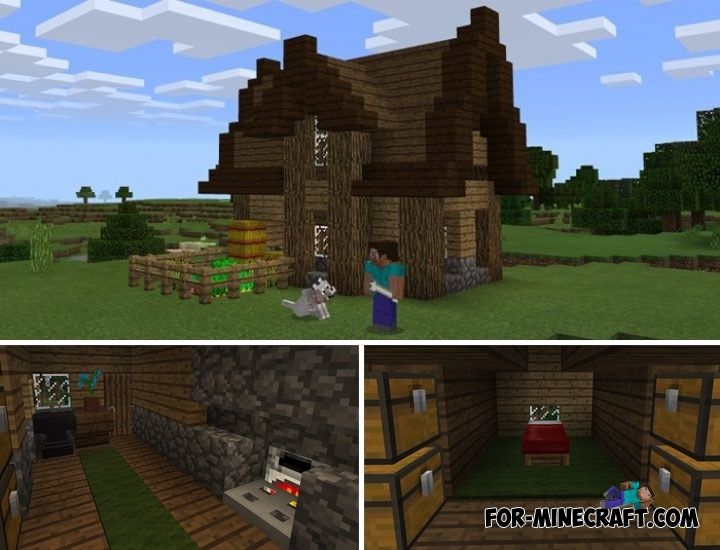 According to statistics, most Minecraft players are not able to build a beautiful and comfortable house suitable for daily stays. Empty boxes or mud houses are the only thing that new players can build. And really, you need to play a lot and consider ready structures to understand how to build a realistic house. If you want to master this skill then it will be good if you start your builder's way from similar houses. It is also an excellent option if you urgently need a peasant house for a small family. The main things are inside necessary for survival in MCPE. Complement the interior according to your desire or enlarge the house by expanding the walls or building new floors. In short, the map is very simple and modest but at the same time very nice house that you can find.